I’m not crying… you’re crying…. The second movie in the How to Train Your Dragon trilogy goes deeper into some serious emotional moments that you do not see in too many animated movies. When we return to Berk, we find that the Vikings and the dragons are living together in an almost Utopian society. When they discover that the evil Drago Bloodfist (Djimon Hounsou) was coming with his dragon army, the community was sent into panic mode. 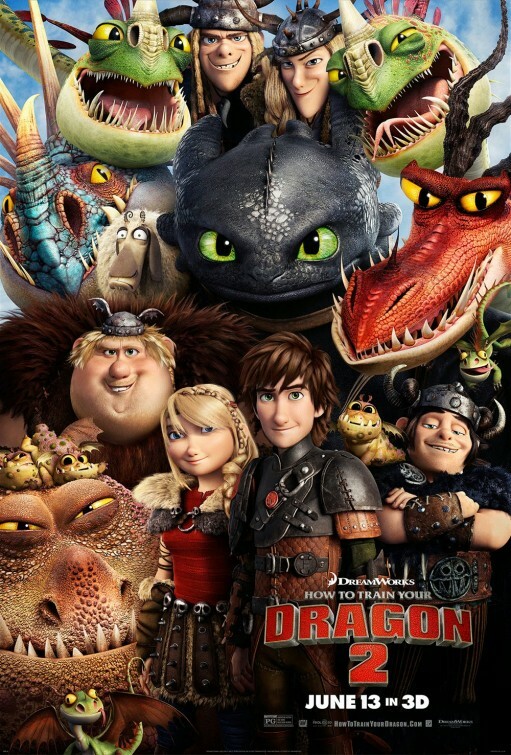 Chief Stoick wanted to hide and batten down their land, but his son Hiccup (Jay Baruchel) wants to change the mind of Drago about the ways of the dragon. Stubborn Hiccup takes Toothless and they fly off to try to talk sense to Drago. However, on the way, Hiccup finds someone that he did not expect to find… his mother Valka (Cate Blanchett). Valka had been rescuing dragons for the twenty years since she was believed to have been killed and the reunion with Hiccup is short and sweet, because the dangers of Drago is real and on the way. This is a wonderful sequel to the original movie. This film has some real deep, mature ideas and messages that you do not normally see in animated movies. Another idea that you rarely see in animated movies is the passage of time. It has been five years since the original movie and Hiccup has grown into a young man who is on the verge of being given the position of Chief of Berk. The animation continues to be awe-inspiringly gorgeous. Everything has been upped in this area from the first film, which was a beautifully animated masterpiece. The scenes of Valka moving form dragon to dragon as they fly through the sky is visually stunning. The set pieces are consistently as good as you are going to get. There is tremendous action in these movies, creatively executed and wonderfully shot by returning director Dean DeBlois. The voice cast continues its excellence from the first film, this time adding the alluring Cate Blanchett as the slightly crazed Valka and Kit Harrington as Eret, one of the dragon hunters working for Drago. The only drawback was in a major SPOILER scene. After a mind controlled Toothless attempts to kill Hiccup and, instead, kills Stoick, I found Hiccup’s forgiveness to be a tad too quick. Sure they were best friends, but Toothless had killed his father. Whether he was in control of the situation or not, you would think there should have been a bit more of a damage to their relationship. When I first saw the movie, I felt that way and I felt the same tonight. The trust between them should have been affected, even if it were just a scene more. Maybe there was no time in the story to fit another scene because they did move quickly into the final battle, but I feel like this would have helped show that the friendship had faced a real stake. I think this movie is just a step behind the first one, but not too much behind. It dealt with some truly major life and death type themes and How I Trained Your Dragon 2 packed a real emotional wallop. Bring on How to Train Your Dragon: The Hidden World!